Bunaken, known for its great wall diving, healthy coral and large numbers of fish, is a pretty island just north of Manado, in the island of Sulawesi, Indonesia. 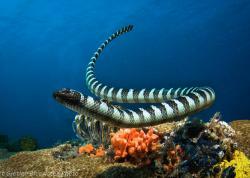 Bunaken diving has great wide-angle underwater photography, and good macro underwater photography. Sulawesi lies just east of Borneo, and just south of the Philippines. 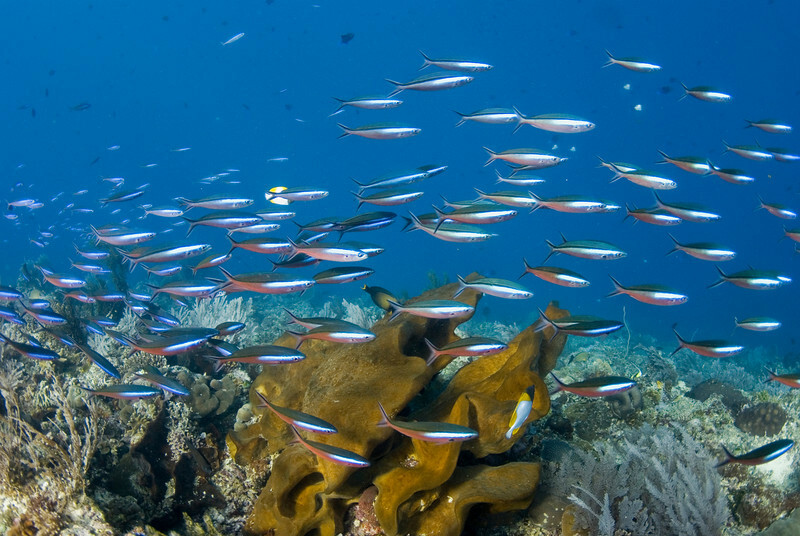 Bunaken's best dive sites for fish were Manado dua, Barracuda point, Sachiko, Mandolin, and Lechuan I shallow at the point (25ft) deep) where the trevally's show up (not Lechuan II or III). Dive them early and often!! Dive shops will try to push other sites, but dive these a couple times each, starting early in the trip. Currents can be strong, with a down current. Barracuda point is awesome, especially if you see the barracuda, but it's a longer boat ride. Make sure you go there, discuss this with the dive shop before the trip. Try to leave at 6AM. I like to dive at the top of the wall in the 40-50ft range, where there is a lot of pelagic action. The flight from Singapore to Manado was an easy 3 1/2 hours on Silk air. we got tickets online for $240 each round trip, a good deal! At the airport, the resort picked us up. the boat harbor was less than 1 hour from the airport, and then it was a quick 30-minute ride to the dive shop. nice, fast, and easy! No check out dives needed for experienced divers... within 20 minutes of arriving (after filling out some forms), you can start diving! We stayed at two-fish divers in Bunaken and Lembeh strait. The resort had several good boats, 6-7 guides (all locals), and capacity for 20 divers. lucky for us feb is a slow month at the resort and they were lightly booked. facilities and accommodation were what you would expect in a mid-range dive resort (no pool or AC, food was just ok), but we were happy with everything, and the bungalows were nice, with plenty of space and a nice porch with a hammock. bungalows #1 or #2 have the best views I think, and are closest to the restaurant. we stayed in #2, which had 1 large bed. the bungalows always had drinking water. they also had a nice standing fan. a few shelves made it easy for us to lay out camera gear in the room, and rooms also had a power strip with US converters, how nice! all dive gear, wetsuits, tanks were brought on and off the boat by the staff/guides, and washed for us every night, so we only worried about our cameras. food was served at 7AM, 1PM, and 7PM. dives were at 8AM (2 dives), 2:30PM, and 6:00PM. penny and I had our own guide the entire time, chris. chris was a great guide with a good eye and I highly recommend him. the boat crew was great too, always helping get tanks on/off. they also supplied us with a rinse tank on the boat for our cameras. coffee, water, tea, and cookies available on the boat at all times. the resort is on the east side of the island, supposedly the "better" side. I heard the other side of the island can get a lot of trash washing ashore. fresh water is also hard to get in bunaken, but the resort is blessed with a well that seemed to supply us with limitless amounts of water for showers, washing gear, etc. the owners of two-fish, nigel and Tina, were always around keeping things running smoothly. Tina still does a lot of teaching at the resort. they seemed to be very customer focused, and always helped accommodate our requests. We got a package that included lodging, food, water, coffee, tea. juices, soft drinks, and alcohol were extra. Internet was $6/hour (dial-up, quite slow). laundry was extra. There's not much to do here other than diving. The transfer to Lembeh was quick. We left at 8:30AM, arriving in Lembeh at 11AM, with time for 3 more dives. And we didn't even have to pack up our dive gear! I saw everything I had hoped for in bunaken. We saw more fish than I've ever seen in my life. Napolean wrasse (almost every dive), many turtles, a few white-tips, tuna (many dives), blue-fin trevally (most dives), 12 bumphead parrotfish, large school of barracuda, a few great barracuda hunting schools of fish, hunting school of jacks, mating big-eye travelly (2 dives), hunting giant trevally (2 dives), never ending fast-moving schools of triggerfish, surgeonfish, fusiliers (many dives). 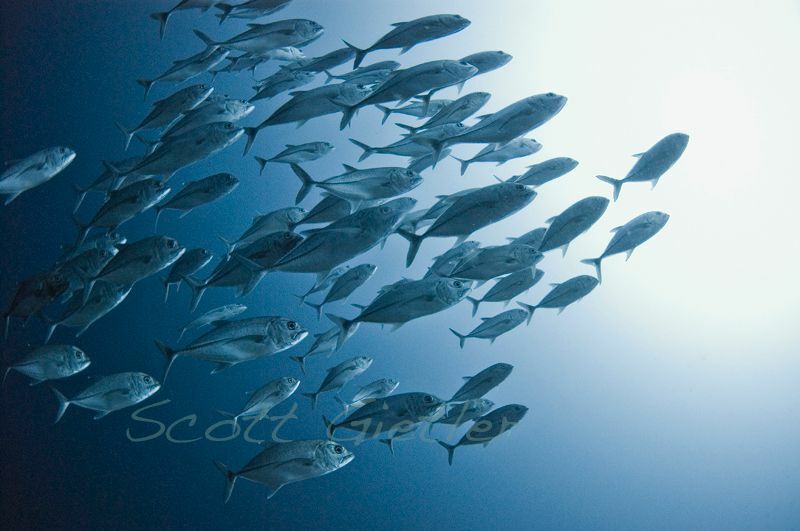 schooling batfish. sea snakes, cuttlefish, 1 eagle ray, many leaf scorpionfish, many nudibranchs, countless invertebrates. large numbers of clownfish. many puffers, filefish, trumpetfish, sweetlips, snappers. mantis shrimp, razorfish, schooling catfish, long-nose filefish, schooling parrotfish. 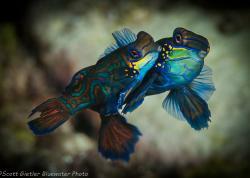 Bunaken is a great place to photograph marine life behavior. 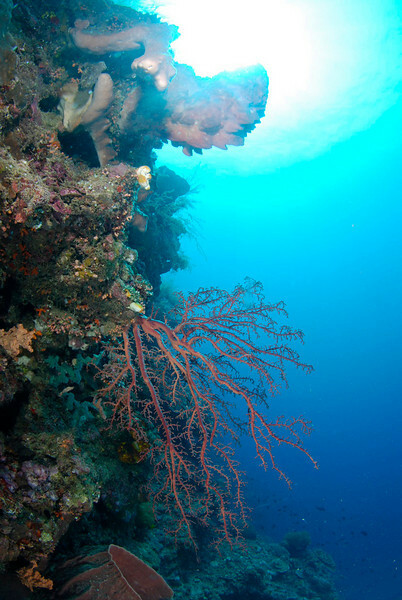 We did 20 dives over 5 days in Bunaken, including 4 night dives. 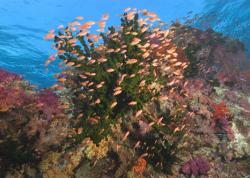 There was unbelieveable diversity of coral and reef fish. uncountable amounts of fish. extremely healthy reefs. We requested a lot of advanced sites, which had strong currents (not just horizontal, but also up-currents and down-currents), but this brings out the fish we wanted to see. most people are mainly brought to the well-known "wall-dives" that bunaken is famous for, which are suitable for divers of all levels. they are beautiful, but with less fish, less currents, and less pelagics. we did minimal dives at these sites. And since we were going to lembeh afterwards, we specifically did not dive the better macro sites at bunaken, opting for the sites with the most fish. Almost every site we went to had large numbers of fish, pelagics, beautiful healthy corals at all depths, currents, a huge diversity of reef fish, and a huge diversity of invertebrate life on the wall. Reefs were healthy from very shallow (10ft) down past 150ft. Dives usually start deeper and gradually get shallower as the dive progresses. We had no problems diving air here. Most dives were done as drift dives, with the boat picking us up where we surfaced. Night dives were great. the large basket stars were beautiful, and most prevalant at the two-fish house reef. we did 3 night dives at the two-fish house reef and never got bored. due to the potential for currents, the house reef is dove from a boat only. 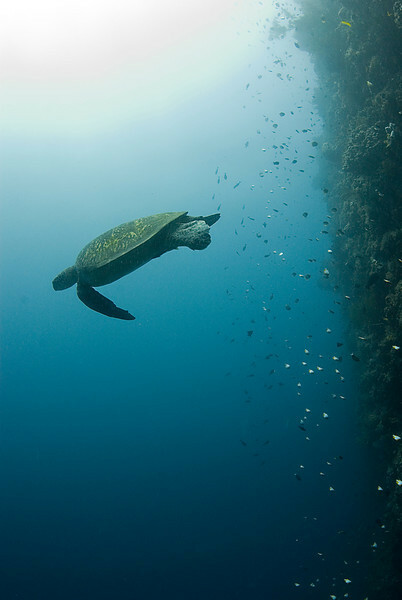 Many dive sites are 10 minutes away, although some are 30-45 minutes away on the boat. No time limits on dives. 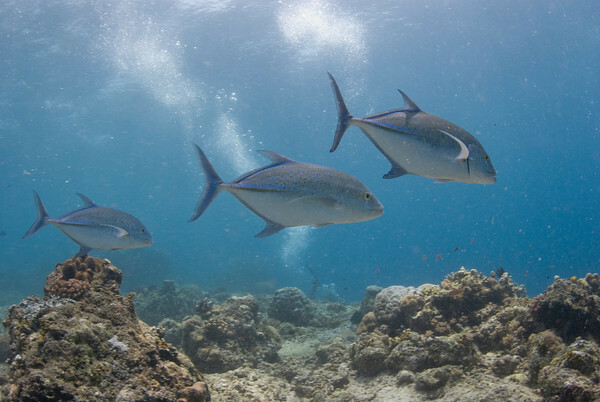 blue-fin trevally. I was hunkered down low in a strong current in shallow water, watching the action around me, and I was lucky to have these fish swim very close to me. turtle, and butterfly fish along a wall. tuna. 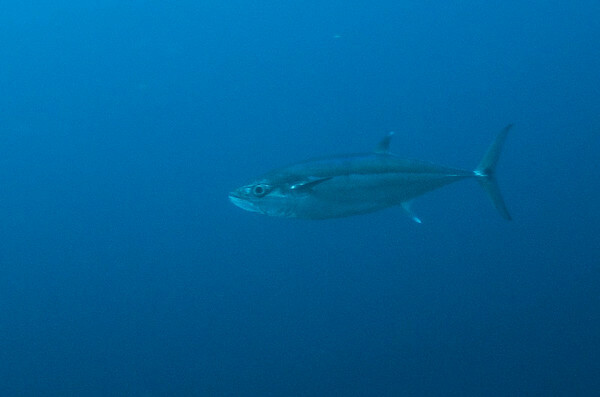 we often saw tuna hunting, usually deeper. this one swam very close to me and quickly raced by. Fusiliers. On many dives there was an ending stream of fusiliers streaming by. Usually I see them at a distance, but this time they were coming by about 15ft below me in a strong current along the top of the wall. I was at 30ft at the time. I was able to swim down so the school was swimming right at me. At the last second they would change direction slightly to go around me and I was able to get this shot with them very close to my camera, coming by very quickly. Shooting at 1/160th helped freeze their motion. Reef shot, on a bunaken wall. 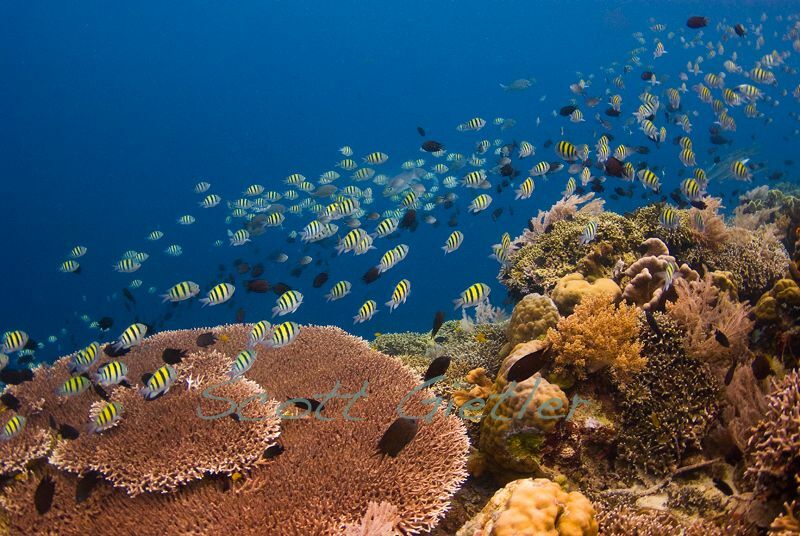 Train of sergant majors, at Siladen island, which has amazingly healthy coral. Hunting jacks. 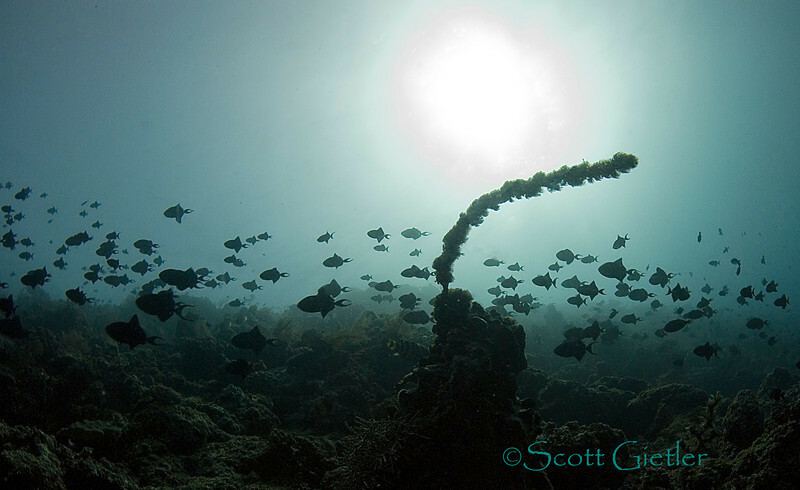 I was diving Bunaken at 110ft when I saw these jacks swimming by below me. they were hunting and moving at a good pace. I quickly dropped down to 142ft to intercept them, going a few feet below them. they passed right by very close, and I got off a couple of shots. barracuda tornado. 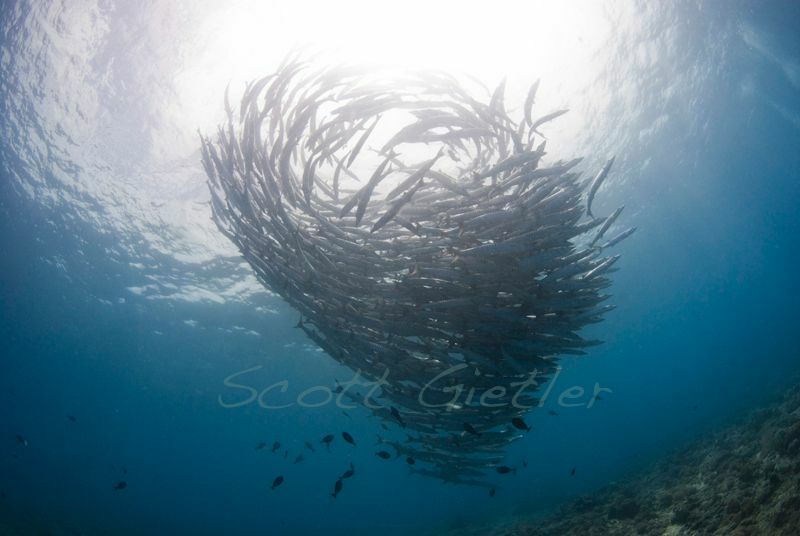 the highlight of the bunaken trip was finding this school of barracuda. we stayed with them for about 20 minutes, and I took a couple hundred shots. However, only in this shot (one of the first shots I took) showed them in the "tornado" formation. perhaps swimming close to them caused them to move into the standardized "polarized school" formation. Barracuda, close up. 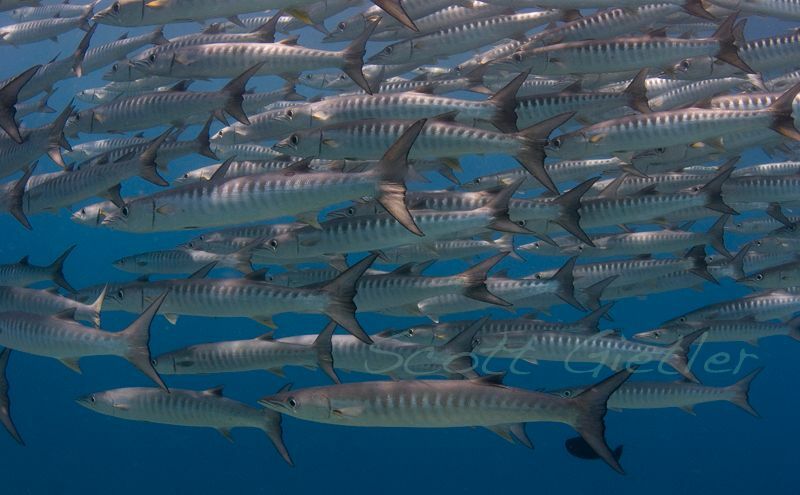 when you swim towards the school of barracuda, they tend to turn away from you and swim away slowly. you can get close, but its hard to get really close. after about 20 minutes I was able to get a little closer, maybe because they were getting used to me. who knows. I was after 2 shots, one with them all facing me, and a side-shot like this one. Both were very tough because when you get close the barracuda turn away. I finally got one shot with some of them facing me, but it still wasn't what I had hoped for. For the shot above I had to get very close with my fisheye lens, which only happened once, and even then I had to extend my arms fully out to close the final distance and snapped the shutter without being able to see the viewfinder. Whirlwind of redtooth triggerfish. Besides the barracuda, the other highlight of bunaken was being able to swim into millions of triggerfish swimming around you an entire dive. it was hard for me to take a photo that does justice to the amount of fish moving past you. they are coming in an endless train all around you, for a long period of time. for me, this was diving at its finest! the first time I dove with these triggerfish, I was without my camera. my wife and I just enjoyed the currents, all the fish, and the sharks, tunas and great barracudas we occasionly saw looking for a meal. 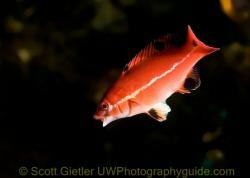 that night I spent a lot of time imagining the shot I wanted showing everyone the beauty of these fish. I returned for 2 more dives with my camera and took a couple hundred shots trying to capture their beauty, but getting the angle, lighting, and concentration of fish close enough to me was hard, even with my fisheye lens. this was one of my two favorites of the group. for me, it was the "endless supply" factor that was hard to capture in a photo. you just had to feel it over the course of several minutes! Triggerfish in current. I like this shot because it shows the power of the current bending the coral. 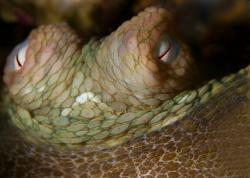 I enjoy shooting wide-angle in Bunaken, and then shooting macro in nearby Lembeh. Fish like Tuna, Napolean Wrasse, Sharks and Bumphead can be skittish and may not allow a close approach. A mid-range lens works best. Sharks are always seen deeper at Bunaken, usually at around 100ft deep. Submitted by Diego (not verified) on Fri, 2011-11-25 08:20. Hey Scott, thanks for all the info (and photos of course), that is very helpful! 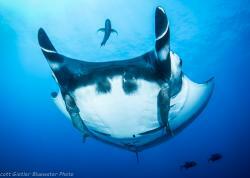 I am going to Bunaken and Lembeh on January 2012. One question: the resort I am planning to stay in, Bastianos, does not allow diving on the day of arrival by plane... is it possible to dive using other operators (two-fish divers for example), even if I am not staying with them? Submitted by Kumala (not verified) on Wed, 2010-09-29 14:53. Love those photos very much. Submitted by rolando (not verified) on Mon, 2010-01-04 23:38. These wide angle shots are prime examples of how great composition bring everything together. Bravo!